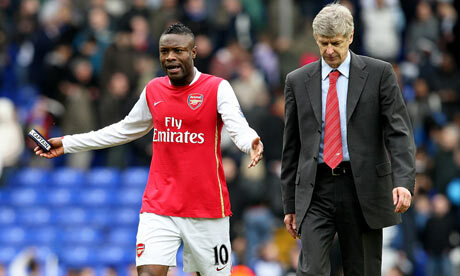 William Gallas has been dropped and stripped of the Arsenal captaincy, according to reports. France Football claim that the outspoken defender has paid the price for his verbal attack on his Arsenal team-mates and will not appear in Saturday’s trip to Manchester City and will be forced to relinquish the armband to either Gael Clichy or Manuel Almunia. Methinks the whole thing was just a publicity stunt for Gallas’ autobiography being released this week. UPDATE: The Guardian has confirmed much of the earlier report. William Gallas is once again airing Arsenal’s dirty kits. The Guardian has him taking the Arsenal squad to task, saying, Arsenal captain William Gallas has questioned the ability of his team-mates to meet the demands required to challenge for the Premier League title, and has revealed the rifts in the dressing-room that are threatening to derail Arsenal’s season. Gallas, who was widely criticised for his actions last season when he threw a tantrum on the pitch after Arsenal conceded a last-minute penalty at Birmingham, said that incident, and the fact that he is captain, means he is now bearing the brunt of the criticism the side is receiving, even though he believes there are others in the squad who are more culpable. “When, as captain, some players come up to you and talk to you about a player … complaining about him … and then during the match you speak to this player and the player in question insults us, there comes a time where we can no longer comprehend how this can happen. 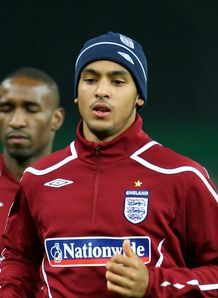 As if things weren’t bad enough for Arsenal, the British press is reporting that Theo Walcott has injured his right shoulder during a practice for England’s upcoming friendly with Germany, and could be out as long as 3 months. Thus, as rats players representing Chel$ki, ManUre, and ‘Pool don’t even bother to show up, feigning claiming various maladies, Theo honors his commitment, only to pick up a real injury and leave Arsenal further strapped for quality players. Gooners will recall Walcott previously injured his left shoulder which required surgery. What have we done, oh footie gods, to anger you so? We play beautiful football with young players of skill and poise, yet you take Rosicky, Eduardo, Sagna, and now Walcott from us. Is there no end to our suffering?